Anti-wrinkle treatment is a nonsurgical process. Trained doctors perform this Anti-wrinkle treatment in Delhi, which makes one look younger. In India, it has started recently and caught up well. Cocoona centre helps you in your dream of taking years off your face. ANTI-WRINKLE is a safe and proven method to take years off your face. Thousands of ladies have experienced the noticeable outcomes of ANTI-WRINKLE treatment at Cocoona. 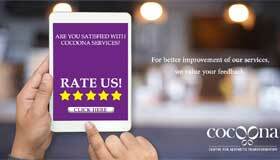 At Cocoona Delhi-India, many patients get ANTI-WRINKLE treatments over the lunch hour and go back to work with no sign of having been treated. The mixture of topical anesthetic along with a tiny needle makes ANTI-WRINKLE treatments a painless experience that needs no recovery. ANTI-WRINKLE can help you look younger with small time period simple procedure. Results are natural therefore the secret stays along with you. Benefits last as much as some time period and also the procedure is repetitive. ANTI-WRINKLE treatment works by simply relaxing the small facial muscles that create expression lines, leaving the skin smooth and unwrinkled. ANTI-WRINKLE eliminates the deep wrinkles within the skin between eyebrows, from the forehead, from the corner of eyes. It is effective for three months, and as the lines gradually diminish, and ANTI-WRINKLE also prevents new creases from forming. It requires ANTI-WRINKLE about small time period to relax the wrinkles and also the effect lasts few months. ANTI-WRINKLE has shown very usefully for excess sweating from the hands, feet, and armpits plus an excellent strategy to Migraine and Stress headaches. Don’t use it if you’re pregnant or nursing. It might contraindicate with other medications you use. Discuss with your physician and don’t hide your medical. Don’t inject when the area has inflammation. Headache, redness to begin of injection, blurred vision, allergic attack and can last around four to six days.